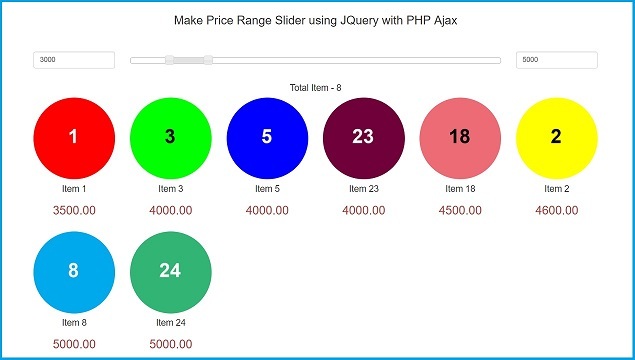 In this post we have cover topic like How to create Jquery Ajax Price Range Slider by using PHP with Mysql. This will helpful to user to filter data or items based on value generated when we have drag range slider instead of type of price in textbox. In current scenario this is most common features in E commerce website for display product or sell product online. Jquery UI Range slider is extremely helpful to append filter quality to our data or item list. JQuery UI Range slider mainly help to search item or data by range of price. Price range slider permit us to filter the list of data by drag price range alternatively of enter of the price physically. In this blog, we have develop a price range slider by using jQuery UI and after this we will append filter feature to item list or data list with PHP and MySQL. The Price range filter is a mandatory functionality in items or products listing and this range slider is a ideal option for price filter. So, Here we will see how can we insert a simple price range slider to item list of products list by using jQuery UI with PHP and then after filter products by price range by using Ajax JQuery with PHP & Mysql. First we have to make table in our database. For this we have use following code.